No mega-busy days expected but it will certainly be busy enough at times. Including last boats and truck bans. 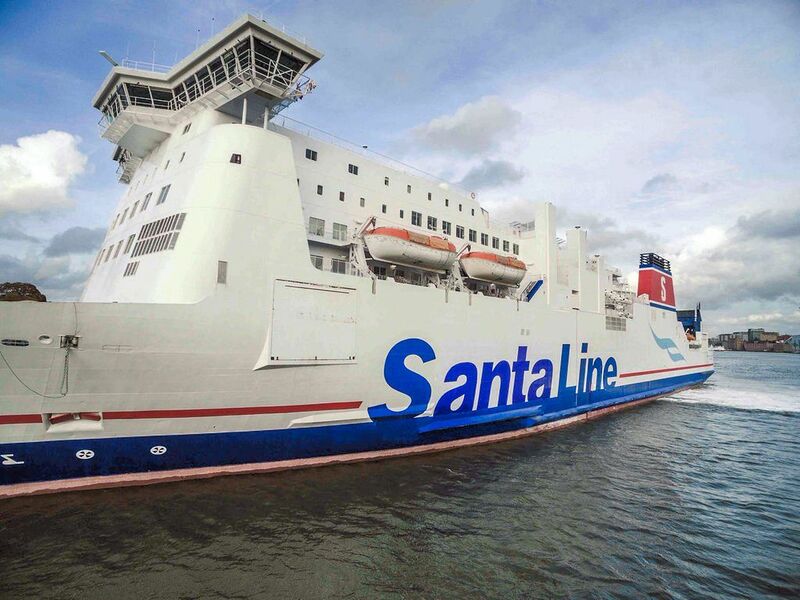 Pushing the boat out for Christmas: Stena Line rebrands Santa Line for the holidays. Considering the millions of drivers off to visit friends and family, and all those going on holiday, there are (expected to be) very few really busy days on the roads over Christmas and New Year. The complicating factors are the border controls in France, and between Austria and Germany, the weather, and whether – as in the summer – drives pay heed to warnings like these and spread the misery. But as things stand, the day to watch out for in France – predictably – is Christmas Eve (Thursday 24 December) as drivers head en masse out of Paris. There are other, lesser, warnings for Friday 18 December nationwide, the next day (but confined to the north and east), Wednesday 23 December away from Paris again, and Sunday 27 December as they all head back again. In Germany the flash points – though, again, one step down from the worst possible – are every Friday this month until, but not including, Christmas Day itself, then Wednesday 23 December and Saturday 26 December. Switzerland is deadly quiet overall but gets busier at the weekends from 12 December, culminating in the busiest of all on Saturday-Sunday 26-27 December. Most of the delays will inevitably be focused on the Gotthard Tunnel. Meanwhile in Austria, apart from being fairly busy on Saturday 19 December, only Saturday 26 December is red marked (though that will be as busy as the little Alpine country can get). In Italy, Saturday 26 December will be crowded in the morning, especially on the A22 Brennero heading up into the Alps. It should quieten down in the afternoon and on Sunday. Meanwhile, the Mont Blanc Tunnel isn’t expecting to be that busy either with maximum 30min delay warnings at various times on Saturday 19, Wednesday 23 and Sunday 27 December from France to Italy, and in the opposite direction on 23-24, 26-27 and 30-31 December. Dover (and other ferry ports) are closed on Christmas Day. The final boats depart early to mid-afternoon on Christmas Eve, with the last one back from Calais – P&O – at 17:45. Sailings resume on Boxing Day morning (see more on opening hours here). Overall, Dover says it expects 600,000 passengers between Friday 18 December and Sunday 3 January split between 200,000 cars and 4,000 coaches. The busiest day will be Saturday 19 December when 80,000 people head off for the holidays. Despite that, it is still possible to buy standard rate cross-Channel fares on the following week days though, thanks to enhanced security checks, DFDS advises customers to check-in 90mins before departure. Finally, spare a thought for people working at Eurotunnel. When it says it works 24/7 it really means it, albeit with a skeleton service overnight Christmas Day and New Year. P&O also operates a limited service overnight New Year’s Eve.